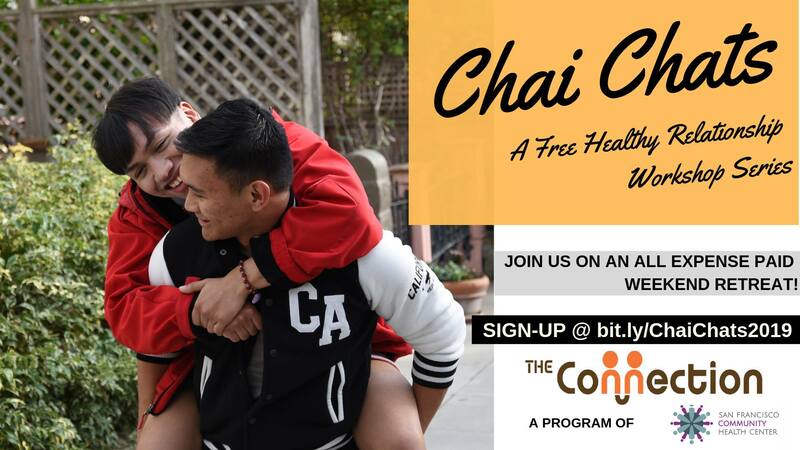 We’re proud to bring back our free healthy relationship workshop series for Asian & Pacific Islander (API) men-who-like-men! Join us starting Wednesday, February 20th as we: examine our communication styles, learn to solve conflict, and understand how our culture plays a role in how we experience relationships. Whether you’re in a long term, platonic, or even a Friends-with-benefits relationship, we’re sure that you’ll learn something new! Singles are welcome! Ages 18 +, Mixed race A&PI folks are welcome! 1) Sign-ups are on a first come first serve basis. Space is limited, so sign-up early! 2) Priority will be given to folks who are able to attend both parts 1 & 2. The Connection is community health and social space for Asian & Pacific Islander men-who-like-men at the San Francisco Community Health Center.